We're heading home to SC. Just in time to enjoy the cooler temps and the long relaxed slide into Autumn. These two sketches were workshop demo's on saving whites when working with watercolor pencils. 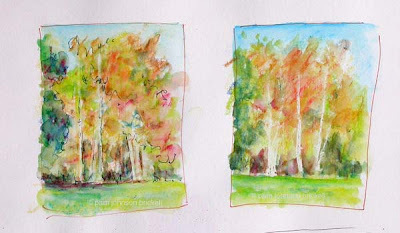 On the left image, I used a colorless blender pencil (normally used with colored pencils) to save the trunks of the trees. It works fairly well but needs to be reapplied after each wash. The right sketch tree trunks were masked. I'm looking forward to fall workshops. I'll be conducting intro's to watercolor pencils, nature journaling, and plein air painting with wc pencils for the Sun City Art Club in September and October. My schedule for SOBA has not been finalized as yet, but it will include some Saturday morning classes.